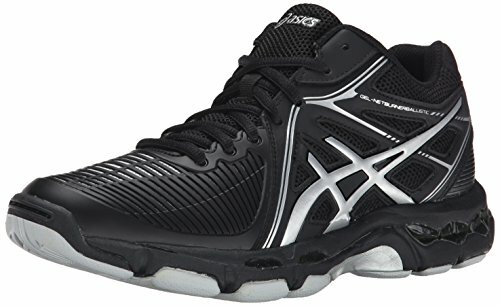 ASICS Women's Gel Netburner Ballistic MT Volleyball Shoe, Black/Silver, 7 M US by ASICS at Zen Slippers. MPN: B558Y.9093. Hurry! Limited time offer. Offer valid only while supplies last. Combines the ASICs advanced running DNA with volleyball-specific technology, giving you the best support and gel cushioning for excellent comfort. Combines the ASICs advanced running DNA with volleyball-specific technology, giving you the best support and gel cushioning for excellent comfort. Traditional lace-up for an easy yet secure fit. Molded foam footbed for long-lasting comfort. Rearfoot and Forefoot GELÂ® Cushioning Systems attenuates shock during impact and toe-off phases while allowing movement in multiple planes as the foot transitions through the gait cycle. A midfoot Trussticâ"¢ System provides improved torsional stability. FluidRideâ"¢ technology in the mid and forefoot provides the ultimate combination of bounce back and cushioning properties with a lightweight construction and exceptional durability. NC RubberÂ® Outsole compound contains more natural rubber content than traditional solid rubber, resulting in enhanced traction on court systems.